Amanda Ree, founder of Sama Dog, offers wellbeing consultation via two (2) package options. During this 1-hour session (via phone or online video platform), you and Amanda will explore your dog’s primary behavioral and/or health challenge. You’ll receive specific solutions and clear guidance for how to best address and resolve areas of imbalance using natural, holistic techniques. If you’ve taken our Dog Body/Mind Quiz and are curious to learn more, a body/mind (aka Dosha) Balancing Session is the perfect option for you. 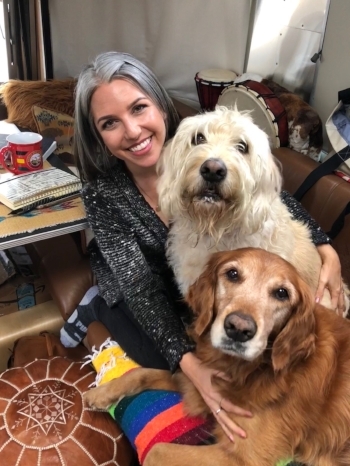 Amanda will thoroughly explain the results of your dog’s dosha quiz and help you better understand how to use this information to help your pet return to a happy, healthy, well-behaved state. You’ll be surprised how much you can do to improve your dog’s health and wellbeing with just a few simple shifts. Receive expert advice on what's truly going on with your dog, and gain a better understanding of how to use nutrition, behavior, communication and more to restore "Sama" (their ideal state of balance, health and joy). If you've been unable to resolve frustrating habits, confusing behaviors or pesky health problems with your dog, the customized Roadmap to Wellbeing will provide you with a clear, effective and holistic action plan. Oftentimes these situations arise and continue in our pets because the root of the issue is not being addressed. This is the goal of our holistic model: understand and provide support for your dog’s body and mind so it's ultimately able to heal itself. Over two private sessions, over about a month, take a deeper dive into applying Ayurveda and other natural healing practices focused specifically toward your dog’s particular needs and circumstances. Amanda will help you discover what’s beneath certain behaviors or ailments with consideration of your pet’s mental and emotional state as well. This package provides you with a comprehensive and entirely customized treatment plan, including follow-up on your dog's progress. Amanda will offer support through the weeks in between appointments and review changes that can be made through food, herbs, energy work, massage, balancing through each of the senses, behavior, training and more. What is a Flower Essence? Not to be confused with essential oils, flower essences are herbal infusions or tinctures, made from the flowering part of the plant, which uniquely address emotional, mental and physical aspects of wellness. The item will be sent to your home after the first session (shipping in the U.S. included in package price). PLS NOTE: Most sessions are conducted via a user-friendly online meeting platform, or telephone. In-home session are available for clients in the greater San Diego area; a travel fee may apply. How has Amanda and Sama Dog helped clients like you? "Thank you for all the valuable knowledge you shared with me today in our consultation. I feel so much better having a plan created with your thoughtful guidance and your years of experience in Ayurveda, rather than my trying to come up with something based on questionable advice in advertisements or newsletters from sources I don’t know. You answered so many questions, and I am particularly pleased there is an Ayurvedic alternative to giving my dog an NSAID for the rest of her life, knowing that NSAIDs can have serious adverse side effects (just like with humans). I’m looking forward to my dog’s Ayurvedic journey with you - she says “thank you” too!" "I rescued my Maltipoo, King, about 2 1/2 years ago. We think he was a stray and since I got him he had been anxious, hid under the bed for a large part of the day, was reactive towards other dogs, and just didn't seem happy. I did a consultation with Amanda and she recommended some dietary changes as well as some herbal supplements, which I implemented immediately. King loved eating healthier food but was still showing the anxious, depressive behavior. Amanda suggested to have King stay at her Dog B&B so she could work with him. Since then there have been major changes in his behavior and demeanor and I cannot thank Amanda, Rene, and their dogs for all they did for King! He is on the path to healing and living a happier, healthier life. I would definitely recommend Amanda and her services to anyone who wants the best for their dog. She is professional, knowledgeable, and so friendly and sincere. I look forward to participating in future workshops and working with Amanda again!" "I reached out to Amanda Ree at Sama Dog for help and direction when my dog Rusty was diagnosed with Cushing’s disease by his vet. After I provided Amanda with the background info and we had an in-depth consultation, Amanda created a wonderfully comprehensive Roadmap to Wellbeing to follow. I began implementing the recommendations for food, supplements, and supporting practices immediately. 1-1/2 months later, I am encouraged by Rusty's positive response to these recommendations. He remains symptom-free and I remain optimistic that I am supporting and strengthening his being. I am grateful to have such a supportive and knowledgeable partner in this journey. Thank you Amanda!" Amanda Ree just puts so much heart into what she does! My Vata girl Juliet, and my Kapha pup Romeo (and I!) just love Sama Dog! We can hardly wait to start the routine suggested, and begin to see the benefits! A beautiful body, mind and spirit approach to wellbeing for dogs + their humans. Thank you so much Amanda, from the bottom of our hearts! All wellbeing sessions provided by Amanda Ree are intended to support your dog’s overall health and wellness. They are NOT intended to be a substitute for required veterinary/medical care, treatment or diagnosis. Always seek the advice of your veterinarian immediately when your pet is in any kind of pain or exhibiting extreme behavior.